Welcome to The Fourth Wall, CHIRP's weekly e-conversation on cinema. This week's subject is the French drama After Love. In Joachim Lafosse’s film After Love, Boris and Marie are a couple separating after 15 years of marriage. They have a big house and a pair of adorable twin daughters. For various reasons, Boris is still living with Marie and the kids in the house that was given to the couple by Marie’s parents. He refuses to leave, she refuses to buy him out, and the audience is witness to the slow-motion crash of a family falling apart. 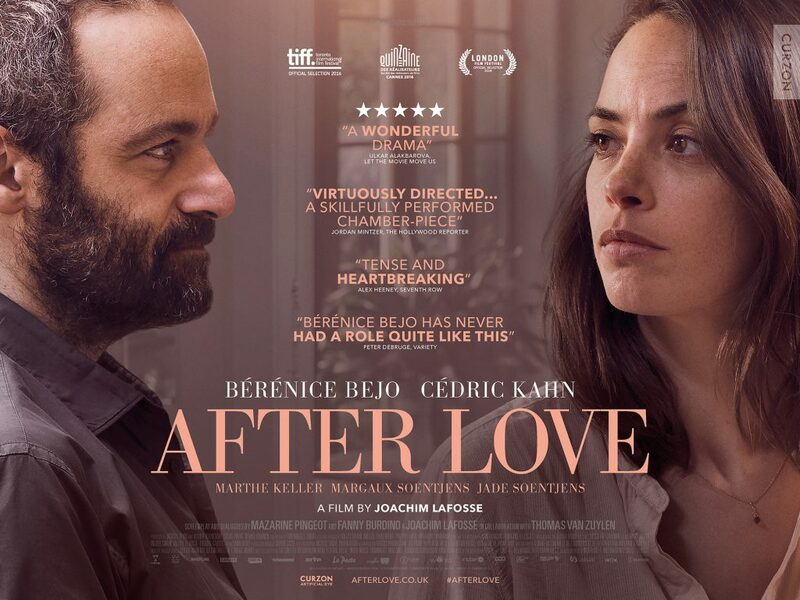 Strong performances by Cédric Kahn and Bérénice Bejo as two people whose relationship has come to an end are complimented by a beautifully stifling atmosphere from the director and cinematographer Jean-François Hensgens. Most of the film takes place in the house where the family lives. The former loving couple’s frustration, anger, and resentment are so palpable, they become characters in themselves. The audience is placed at a similar perspective to Boris and Marie’s daughters, friends, and extended family as witnesses to the emotional war between these two people. I felt like After Love is one of the most apt titles for a film that I’ve seen in a while. But then I saw the film’s original French title, L'Économie du couple (“The Economics of a Couple”), which made even more sense. The emotional and personal turmoil this couple goes through is fueled by conflicts about money. The major questions boil down to: how much did each person invest in this relationship, and how much is each person owed? I felt like, in this sense, the film can be read not just as a story of personal tragedy but also a comment on a Western capitalist society where money is a valid substitute for self-worth. Kevin, as you watched Boris and Marie’s story unfold, did you find yourself taking a side? Was one character’s “argument” more valid than the other’s? I think it's natural to take sides during films of relationship strife, though a well-crafted story such as this one should have the viewer waffling about whom they support. And ultimately, don't we feel sympathy for the kids most of all? They aren't at the age where they can often find words to articulate their thoughts, but the constant discord, from low-grade tension to outright yelling matches, probably takes a larger toll on the girls than their parents. Did you ever see Before Midnight? The Before trilogy is near and dear to my heart; spaced nine years apart, the tales are walk-and-talk snapshots of a couple (played by Julie Delpy and Ethan Hawke), from their first meeting to their eventual marriage and beyond. And because of the jumps in chronology (which director Richard Linklater also used to great effect in Boyhood), we as viewers wind up mentally extrapolating the preludes... particularly in Midnight, when a number of off-screen frustrations finally boil over in one of the most brutally-authentic arguments I've seen in any film. In After Love, I found myself doing the same sorts of extrapolations, seeing as how we're essentially picking up the story of the marriage in mid-stream. They'd been together for 15 years. At what point did doubts start to enter Marie's mind? Was there a part of her that was always concerned about their compatibility, given the disparity in wealth and education between her and her husband? Might things have come to a head sooner if they hadn't had children? What was the final straw for her? As far as the economics of the relationship, I think the money here -- as in many other breakups -- is used by both sides as a proxy for "winning" or "losing." It's pride. Do the final numbers ultimately matter? If money weren't an issue, the sticking point might've been the custody time instead. Clearly, Boris' lack of wealth didn't matter much during the courtship phase, so what was the real source of discontent? Or perhaps Marie's priorities changed once they had children? My natural inclination was to side with her because she and I seemed to value the same things (she was educated, she was an avid reader, etc. ), but on the other hand, who did she think Boris was when she married him? There's one other key figure in the film, and that's Marie's mother. Seeing as how it's her (along with her late husband) that is the source of the family's money, you might expect her to be a factor in undermining the marriage? "He's not good enough for you," etc. But she counsels quite the opposite, and thinks her daughter is being unrealistic with her expectations. Passion always fades, she says, adding that it's natural for the relationship between a wife and husband to evolve over time. It's a refrain you often hear from older generations: younger folks expect too much from marriage, and thus are inevitably disappointed. And of course, in many societies, even the notion of "marrying for love" isn't seen as a great foundation for a long-term relationship! It's certainly a question with a lot to unpack, but where do you stand regarding the issue of modern-day marriage and expectations? And do you have any favorite films which dissect this topic? You are right, Marie's mother manages to say a lot about marriage in a few words. Hers was a very good portrayal of someone who's a bit world-weary but is not an overbearing caricature of cynicism. Overall, I kind of side with Marie's stance on being proactive about resolving the couple's situation, but it's obvious Boris has nowhere to go. His secret meetings with business partners that his daughters secretly witness suggest he's in some physical danger outside the house as well. It would have been very easy for the filmmakers to make one of these two people out to be the "bad" parent. But a big part of the narrative involves how their love for their children is as plain as their animosity toward each other. The way the story is told, I feel for both of them. I only know of Before Midnight by reputation, but I've heard great things about it. I think the closest movie I remember to After Love in terms of theme is the Joseph Gordon-Levitt film (500) Days of Summer. That movie didn't involve a marriage, but the two films do take close and ultimately unsentimental looks at what happens when love ends. I think that is a weak spot for American movies in particular. There's an unspoken storytelling requirement that things will work out before the end credits, usually due to the couple somehow rediscovering what made them fall in love in the first place. I feel like these kinds of rules, both philosophical ("Love conquers all.") and operational (any story involving an attractive female character between 25 and 40 must focus on motherhood in some way) are still a big part of American movies and TV shows, even the so-called "edgy" projects that pop up occasionally like Amy Schumer's Trainwreck or pretty much any Judd Apatow movie. At least that how it seems to me. In your movie-watching journeys, have you noticed a kind of difference in how U.S. films and films from other countries treat the subjects of love, romance, and domestic bliss? I've got another, unrelated question. I saw After Love at Facets Cinemateque, one of the oldest independent film houses in Chicago. I used to go to art-house movies a lot years ago, but not so much lately (although I have been recently going to Chicago Film Society screenings). Netflix and TiVo have fundamentally changed how I get most of my content. I must say, though, I got a bit nostalgic sitting in that odd-shaped screening room, watching a relatively obscure movie with a group of like-minded patrons. It's a different feel than the ultra-modern blockbuster theaters, which for all their state of the art technology, feel more like a mall than a place to see art. At this point in my life, "at home" and "art house" are my preferred places to watch movies, with "modern multiplex" a definite third. How do you feel about it? I'm right there with you as far as venue preferences -- though modern multiplexes would be much more tolerable if they simply trimmed the number of commercials/trailers shown? (You can't even sit in silence before the start times at those places, either, since the commercials are often running well in advance.) The one saving grace with newfangled theaters? Stadium seating. Stadium seating is a glorious thing. 1) One of the biggest differences I notice between American and European films of any genre is the use of music -- specifically, how much less of it is used in the latter. I think Hollywood films tend to hit the viewer over the head as far as using film scores to generate emotion? (Here's where we have madcap antics! Now here's where the strings come in to accentuate this tender moment!) Subtlety often ain't a strength. But particularly in French cinema, I feel that moments of vulnerability are allowed space to breathe? 2) This might be a contrast between mainstream Hollywood and indie fare as opposed to any American/foreign divide, but let's face it: most films -- hell, most forms of entertainment in general -- want audiences to leave with a positive vibe. So I completely agree with you in that a typical story of this ilk would have the couple/family reconciling and living happily ever after. In fact, it's a bit of shock when this doesn't occur in major American films... like in, say, Ordinary People or American Beauty. This is a broader issue, but I've always been fascinated with the mystery of why we're sometimes drawn to art that makes us feel sad? (Nick Hornby explored this topic a bit re: pop music in High Fidelity, though I'd argue that while the lyrics of many pop songs are full of heartbreak, the melodies generally are much more upbeat.) I view films like After Love as cathartic in a way, in that they help me reach emotional places that I sometimes have a tough time getting to on my own. 3) Finally, you mentioned (500) Days of Summer -- I had some issues with the film, but there was a scene where the protagonist attends his ex-girlfriend's (Summer) party with dreams of reconciliation, and a split-screen was used to illustrate the differences between his expectations and the reality. Fantastic sequence, and a genius concept. Share September 8, 2017 • http://chrp.at/1q3U • Share on Facebook • Tweet This!